Early morning mist rising from a lake is a common feature of autumn. It occurs on those first chilly days when the air temperature is colder than the water. The horizon can be hard to distinguish on such a morning, and this image reflects that. This is a new departure in technique. Previously all of the images have been "hard edged", and created from a single output file. 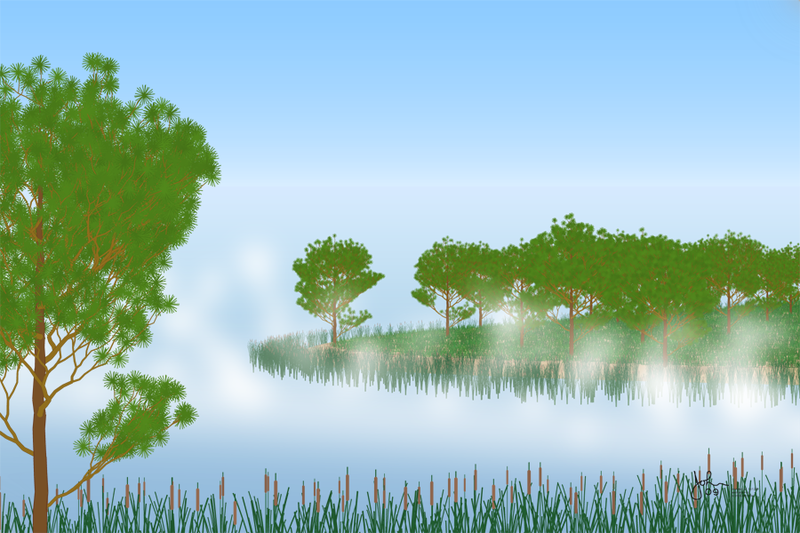 Here the data has been split into more than one file -- (1) a "background" holding the sky, water, and the objects on the little peninsula; (2) more than one file with simple white circles for the mist; (3) a file with the foreground pine tree and reeds. The files (2) are blurred using Photoshop, and then the images are combined as Photoshop layers. I have long understood that effects of this kind are possible, but this is the first exploration of this idea.